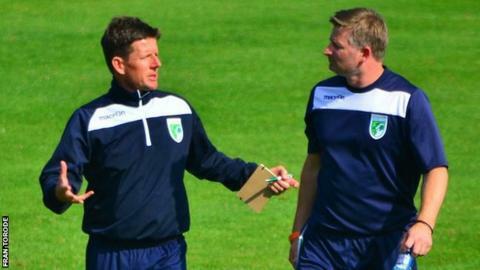 Guernsey FC are going into a critical period of their season, according to coach Steve Sharman. The Green Lions begin a run of eight games in four weeks when they host Three Bridges on Saturday. "If we are to succeed, and we're more than capable of succeeding, we've got to go through this period and pick up as many points as possible," he said. "We've been working incredibly hard in training around some key elements of not being easy to beat." Guernsey lost for the first time in seven league games at Carshalton Athletic on Monday night, but are 11th in Isthmian League Division One South and have games in hand on a number of the teams above them. However, they will face the current top two, Folkestone Invicta and Molesey, and three other sides in the top eight before the end of November. "We're going into a period where we have a really intensive game programme," Sharman added. "We've done really well in the last six games prior to Carshalton, but you have to chunk out the season, so the period before Christmas, playing teams that are just above us is important. "We have games in hand, we need to take advantage of that and two home fixtures couldn't really be better for us to start with."